I have no idea why it has taken me so long to make pulled pork. We’ve owned a crock pot for quite some time now so I couldn’t use that as an excuse. I like pulled pork and so does Tom, so that isn’t a reason either. So really, I just have no idea why. 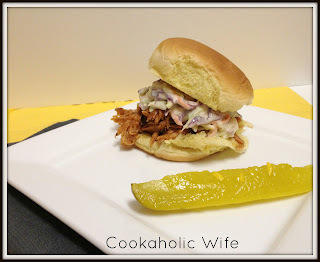 But the other day I had a desire to have a saucy bbq pulled pork sandwich topped with coleslaw on a big hearty roll so I added pulled pork to the menu. 1. Place pork in a 6 quart crock pot. Add liquid smoke, red wine vinegar, garlic powder, pepper, and 1/4 cup of barbecue sauce. 2. Cook on high for 9-10 hours. Remove the pork from the crock pot and shred. 3. Return the shredded pork to the crock pot, add the remaining barbecue sauce mixing well to coat and cook on low for 30 minutes. 4. Serve on toasted buns with coleslaw. My only regret was not making this sooner. The pork is absolutely delicious and I’ve been eating the leftovers for three days now without any complaints!